It seems from this test that there is a negative correlation between what we are taught by education or upbringing and the capacity to be a genius. Now you could argue that George Land's test is dated or have doubts about the soundness of his methodology. However, you cannot deny that education has prepared us first and foremost for a place in society, for a J-O-B. Building knowledge and skills to increase performance behaviour for our adult professional life. Whether these learnt behaviours actually match our innate talent, emerges for some at a young age (wonder-kid or high school drop-out), for others at an older age (career swappers) but for most of us never at all. We are all born unique, but many of us sadly die as a mass product of society. What we did has defined who we are, instead of the other way around. So if everyone is a genius at birth and has the capacity to be great, what exactly is that talent 'thing' that distinguishes us? 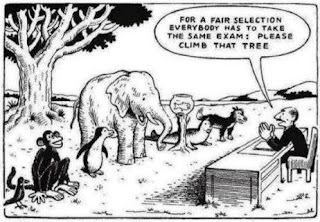 Could it be that in business we identify talented people on behaviours that might not have anything to do with their TALENT? At least it is not as conclusive as e.g. in sports or in certain arts. Now let's assume that this is in fact a system error, still these acquired behaviours may have great value for your business. In the end, knowledge and skills are the vehicles for performance behaviour. And those who are eager to continue learning are likely equipped to improve their performance, increasing the chances to success for themselves and consequently the company they work for. 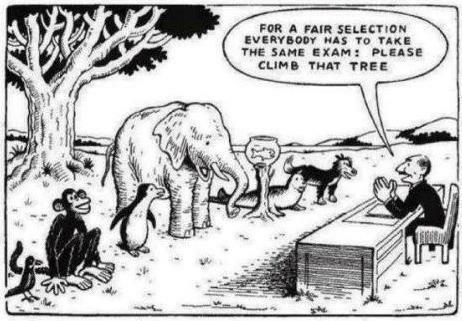 If the task is 'to climb a tree', one can execute it and has the ability to raise standards, who cares it is a fish? Maybe nobody does. The sad thing is however, that somehow it is missed out that the fish could have been the fastest swimmer. A task that was already assigned to Sid the sloth. Of course, the system would probably not allow for such flexibility that everyone can be shuffled around within a company towards a job that better fits their innate ability. Anyhow it would take a lot of courage of leaders to do so without any probability of successful performance behaviour they are so used to measure through knowledge and skills. The alternative for finding the best job for your employee is evidently finding the best employee for your job. Now in a business era of extreme competition where time is money, companies are fighting for the best tree climber. And so the war for talent has started. But as I am still learning, I am sure I have missed some lessons. Can you teach me?